There are two other important gloxinia milestones that need to be mentioned – the development of plants with (1) spotted flowers and (2) double corollas. There is a class of gloxinias generally referred to as ‘tigrinas’ that are characterized by having the corolla pigmentation distributed as very small spots, rather than uniformly. The first images of such flowers were both published in 1867, in Revue Horticole and La Belgique Horticole. A third image, that of the highly spotted Gloxinia variabilis, is from Revue Horticole in 1877. Edouard Morren, writing in La Belgique Horticole, states that these types arose spontaneously from S. speciosa. 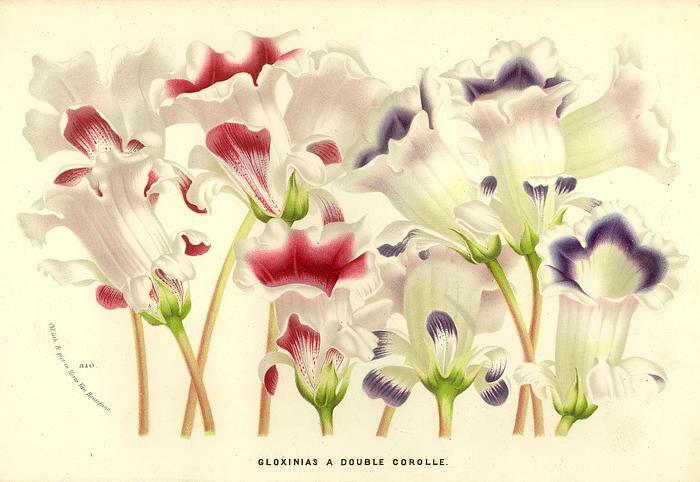 However, a Monsieur Duval, writing many years later, claimed that Jules Vallerand crossed “the Sinningia-Gloxinia” with Gloxinia erecta to get the spotted types. “Sinningia-Gloxinia” refers either to Sinningia guttata, which has a heavily spotted corolla, or a hybrid between this species and S. speciosa. There are at least five references in the old literature where such hybrids are discussed, often with the other parent being Gloxinia rubra. Sinningia guttata (left, Edwards 1827) was described early in the 19th Century. 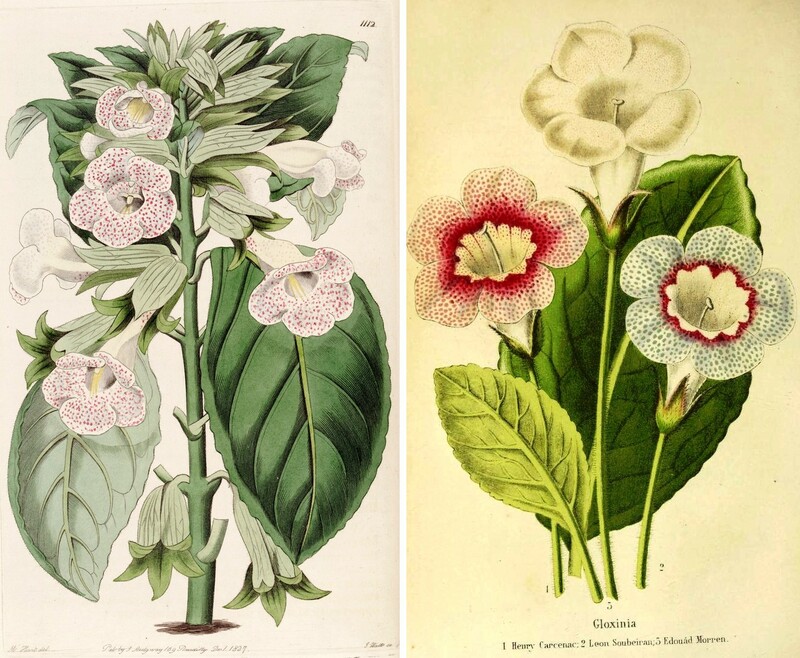 Forty years later, questions arose as to whether it had been the source of spotting in Gloxinia hybrids, as in the illustration to the right from La Belgique Horticole (1867). Images of gloxinias with semi-double corollas were first published in The Floral Magazine in 1868. According to the accompanying text, these plants came from Ireland in 1864 and were named for Lady Cremorne and her gardener, John Grey, their originator. It should be pointed out that this form of corolla doubling is different from the fully doubled flowers we know today. These early (and apparently extinct) forms had extra petal tissue on the outside of the corolla tube, and this tissue often arises from the calyx. In modern doubles, the stamens are converted to corolla tissue (on the inside of the flower), which is why there is usually little or no pollen produced in these flowers. This mutation has been shown to be genetically dominant, and seed of double-flowered cultivars gives plants that are 50:50 singles and doubles. This print from Van Houtte (1873) illustrates the early form of “double” Gloxinias. As in earlier publications, the extra corolla material is on the outside of the flower. While the origin of the mutation giving rise to modern doubles is unknown, it most probably arose in the second half of the 20th century, since double-flowered gloxinias are not mentioned by Hal Moore in his book in 1957, or in either the first or second editions of Peggie Schulz’s book Gloxinias and How to Grow Them (Schulz 1953, 1965). However, they do show up in chapter 19 of her follow-up book Gesneriads and How to Grow Them (Schulz 1967), where they were said to have originated in Europe (page 256 and plate XVII). Sinningia speciosa double hybrids are widely available, and come in a range of colors and plant habits. The blue/purple flowers to the left come from a large standard-sized plant. The pink and white flowers to the right are from a very compact plant. So in the course of about 85 years, plant breeders with no quantitative knowledge of genetics transformed the humble wild S. speciosa, a plant that is so well adapted to life in the Atlantic coastal forest of Brazil, into an extravagant ornamental that can survive only in the care of humans. Louis Van Houtte in Belgium, Jules and Eugène Vallerand in France, and the Veitch nurseries in Great Britain were among those responsible for this amazing transformation and for popularizing the plant in Europe during the latter half of the 19th century. By the mid-20th century, the focus had shifted to the U.S., where firms such as Antonelli Brothers, Earl J. Small, and the Buells of Eastford, CT continued to breed new gloxinias for the commercial market. Fortunately for us, the story doesn’t stop there. In the 21st century, Australian breeder Charles Lawn continues to delight and amaze with his incredible creations, and a wide variety of commercial seed lines, often F1 hybrids, have been produced and are available to the trade. And there are several groups for gloxinias on FaceBook, where members describe their crosses, show images of plants, and trade in seeds and tubers. F1 hybrids of Sinningia speciosa offer uniformity and hybrid vigor for commercial production. ‘Double Brocade Mix’ (left) and ‘Empress Mix’ are two such hybrid “Florist Gloxinias”. F1s are created by crossing two inbred (true-breeding) seed lines; the result is both hybrid vigor and good uniformity in the resulting plants.